Ladybugs, or lady beetles (Hippodamia convergens) are the best known garden predators available. 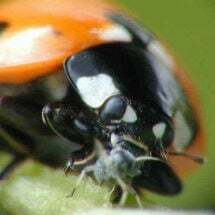 The subject of popular children’s books and a universal sign of luck, lady beetles — also known as ladybugs, or ladybirds (Hippodamia convergens) — spend their lives in both adult and larval stages feeding on mites, aphids, other soft-bodied bugs and all the insect eggs they can find. 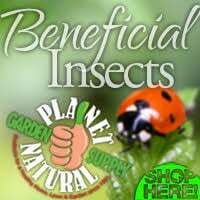 Shop our large selection of beneficial insects, including live ladybugs, at Planet Natural. One half pint — 4,500 ladybugs — treats an average size garden for $32.95 with FedEx 2-day shipping included! 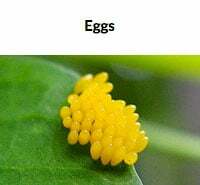 Every gardener has spotted the lady beetle’s cluster of bright yellow eggs on plant leaves and stems. Within a week the eggs hatch and the insatiable, horned and segmented larvae emerge seeking food. 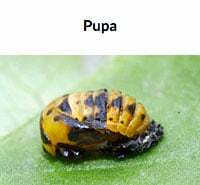 The larvae go through three molting stages and, depending on conditions, will pupate after three to four weeks. It’s another week before the adult emerges, ready to resume feeding. H. convergens will generally go through one or two generations during a growing season, often synchronized with the advent of aphid infestations. 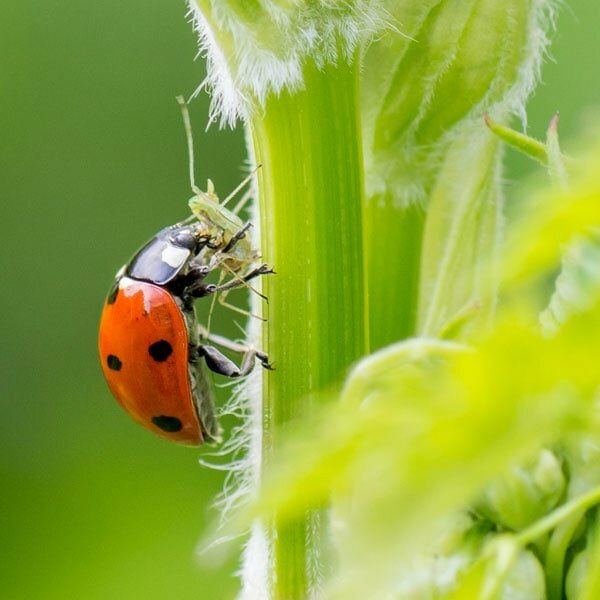 Plants that provide the adults with a source of pollen and nectar will help encourage these popular beneficial insects to stay in your garden. Adult beetles are shipped in cotton bags mixed with wood shavings. Water the area to be protected and gently shake the contents evenly over the pest infestation. With sufficient food available, ladybugs will likely stay in the area. However, it is not uncommon for them to take flight if not enough food is present. 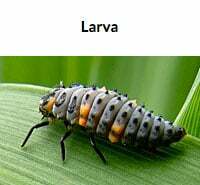 Note: Larvae will eat approximately 400 aphids prior to pupating. Adults will consume more than 5,000 aphids during their lifetime.